A frisky feline makes her stage debut. Little Lola, a cat with limitless energy, starts her day with yoga-style warm-up stretches, jumps and runs through the park as if in the Olympics, and then dashes into a theater. 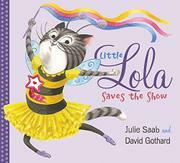 Human children in colorful costumes (and with varying skin and hair colors and hair textures) are readying themselves to put on a show, and Lola energetically tries on different Broadway fashions until she finds the perfect fit. Forsaking flamenco, jazz, hip-hop, and step-dancing, she joyfully dons a bee ensemble. She then flits across the stage in an assortment of perfectly executed ballet steps. Or are they? Lola, alas, is not alone on the stage, and her solo antics create a messy mayhem. Lola is a team player, though, and proceeds to clean up all the upended scenery and mussed-up costumes, energetically of course. There is a red carpet for Lola at the end, which she rolls out in another solo turn. Sleep finally comes next to her pavement star. Lola may be a stage manager’s nightmare, but she is always a cheerful dynamo. Saab and Gothard, a husband-and-wife duo, introduced Lola in Little Lola (2014), and in this second outing she continues her irrepressible ways. The spot and full-bleed watercolors once again convey a spirit of lighthearted fun.